Late in the afternoon I swung by the nearby mall to buy things for the apartment. I wanted a break from the studying-sleeping cycle I've had these past days—well, mostly sleeping. The air was cold and fresh because it had just rained; it was the perfect time to go for long, solitary walks. I think best during these moments. A lazy afternoon. Just woke up from a two-hour nap, thanks to the rain and the cold and the hypnotic silence of my room. When was the last time I took a siesta on a cool, rainy day? As a child I used to detest my father for forcing me to sleep after lunch, but now I regret my stubborness. Had I obeyed him, I'd have grown up to six foot tall. Now I'm among the shortest guys in class. With Diomedes Maturan's ballad, Sa Sulyap Mo, playing in the background (also one of my father's favorites), I groggily browsed through emails and blogs I subscribe to. My stomach felt empty, so I took a generous bite off my roommate's snack, the sesame-coated tikoy by Salazar Bakery. When it comes to food, I have very low EQ. I also browsed through my iPod's pictures folder, which mostly has photos of food I enjoyed recently. I felt hungry. 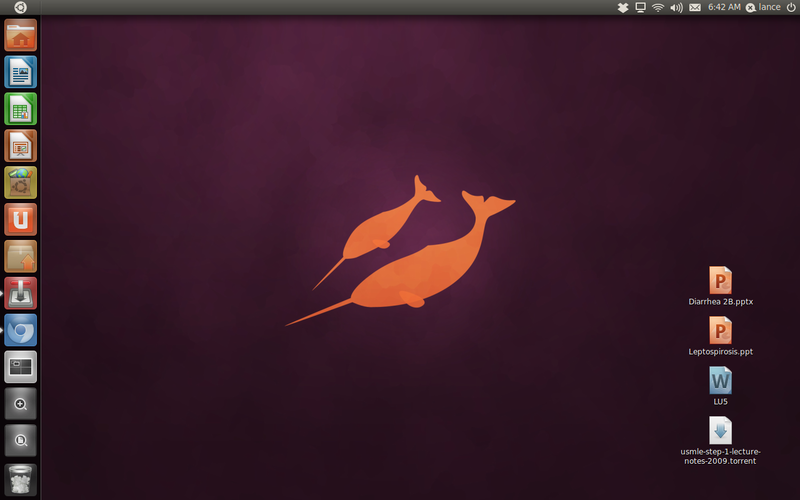 I recently upgraded to Ubuntu 11.04 Natty Narwhal which now features the Unity desktop. The 11.10 version is already on its beta-testing phase. For now, my machine looks more like a Mac than a PC, but it's not quite the same as the other two. What strikes me most is the sheer beauty of the desktop. There's a dock in the left side that disappears when the mouse isn't hovering over it. The notification icons in the upper right corner also look sleek. The windows open smoothly. Unfortunately, 11.04 requires a much faster desktop. I noticed that my computer—which has fairly average specs—has significantly slowed down, especially with three or more memory-requiring programs running in the background. 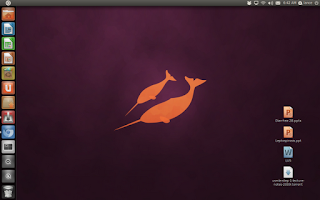 I also mourn the loss on the Gnome desktop, which I've grown rather fond of throughout all these years because of its accessibility and functionality. The Dash (analogous to Mac's Finder) doesn't quite cut it, but give it a couple more months, and it's going to be just as well. That's the joy of being in Linux: geeks all over the world are collaborating to make your life easier—for free. This is the release that has made me do the most personal adjustments, and so far, I'm enjoying the novelty of the experience. The gospel account of Jesus calming the sea and waves (Mark 4: 35-41) paints a vivid picture of our Lord's humanity and deity. Jesus took the entire day teaching parables to the multitude. In Chapter Four we see Jesus speaking about the parable of the sower and soils (verses 1-12). As soon as He was alone, His disciples and followers began asking Him a number of things. "What does the parable mean, Lord?" And Jesus patiently answered them as He related two other stories: the parable of the seed (verses 26-29) and the parable of the mustard seed (verses 30-33). We don't see how physically tired Jesus was until we begin to read verses 35-41. As they were crossing the Sea of Galilee, "there arose a fierce gale of wind, and the waves were breaking over the boat so much that the boat was already filling up" (verse 37). The disciples panicked—from experience as fishermen, they probably knew what a life-threatening situation in the sea looked like. They knew they could die any minute! And yet, we find Jesus in "the stern, sleep on the cushion" (verse 38). And why is that? It is true that our Lord wanted to teach His disciples a valuable spiritual lesson, but could it be possible, too, that He was also just tired? Footnote (2011) is a Hebrew father-and-son film I enjoyed recently. The father is Professor Eliezer Shkolnik (Sholomo Bar Aba), a Talmud scholar who has invested his life scrutinizing ancient Hebrew texts. His frustration is that he has never once been acknowledged for his academic work, which would otherwise have been groundbreaking, had it not been for his colleague who published a paper ahead of him, rendering his lifelong work obsolete. Eliezer's achievement, if you can call it that, is his having been mentioned in a footnote on a book written by a legendary scholar. I may have to call this on-going seven-photo-a-week project "Saturday Mornings" because I take most pictures in that time period, but I shall resist the temptation—at least, for now. I just learned that this blog got linked in MV Logos Hope's official website. Many thanks to the staff! My friends and I certainly had a blessed time inside the floating bookstore. I'm currently reading David Copperfield by Charles Dickens. The English author calls this work his "favourite." I bought my copy at the MV Logos Hope a week ago. The edition I'm using is published by Wordsworth Classics and features wonderful illustrations by H. K. Browne. Congratulations, UP College of Medicine Class of 2017! It's this time of year when I'm getting more than the usual number of traffic, mainly referrals from Google. And then it hit me: the list of qualifiers to the UP College of Medicine Class of 2017 is finally up. Here's the list published by UP Medics, the College's official student publication. Congratulations! I know a couple of names in the roster—a friend's sister, people I once saw loitering around Albert Hall, a former classmate—and I'm happy for them. Clearly it's the start of a new chapter in their lives: more sleepless nights, more studying than they've ever done before. I wrote To the Freshman of the UP College of Medicine two years ago, and nothing much has changed, I guess. If your name is in this list, that entry might help you. But here's a tip I didn't include, one that can make or break your day—where to eat a hurried one-hour power lunch. I first heard of George Müller when Kuya Lito (our youth pastor) spoke about him as an illustration one Saturday afternoon. The subject was prayer. So here was this man, George Müller, preacher from Bristol, who housed and fed a thousand homeless children in 19th century England, who lived by prayer and faith alone, and who advertised his needs to no man but to God Himself. His prayers were answered in the most extraordinary situations. His life was a testimony to the Lord's faithfulness and greatness. Prayer—rather, prayerlessness—is something I struggle with daily. I wanted to be challenged and encouraged. I figured I should read about the life of someone who has matured and emerged victorious in this crucial Christian discipline. Thankfully, a kind friend from church, Ate Milaine Espino, offered to lend me a copy of one her books, George Müller: Delighted in God written by Roger Steer. I met old friends from college last Saturday. We had breakfast at an old restaurant along Ongpin Street called Saludo's. Some of us went to Logos Hope, a ship with lots of books inside it—some 5000 titles, we were told. I was the block's appointed OB-Gyn liaison officer (LO), a post I held for a month. Not that I deserved it, of course: I was volunteered by my wretched blockmates out of spite. I say that lovingly. As the LO, I coordinated the scheduling of posting assignments, relayed both early and last-minute announcements to the block, pleaded our requests to the course coordinators, and answered a number of questions about the most minute, insignificant details. This was a glorified secretarial job, but for a person like myself who hardly keeps schedule print-outs, let alone commit them to memory, who lives by the day—by the hour, actually— the task was a major challenge.